In the previous article, we introduced how you can enjoy jinrikisha. Now we will introduce where you can enjoy it! You can enjoy beautiful and well-known bamboo forest, many temples, beautiful sakura (cherry blossom) in spring and momiji (golden leaves) in autumn here. Basically you can take the rickshaw around a famous bridge called Togetsu-kyo (渡月橋). 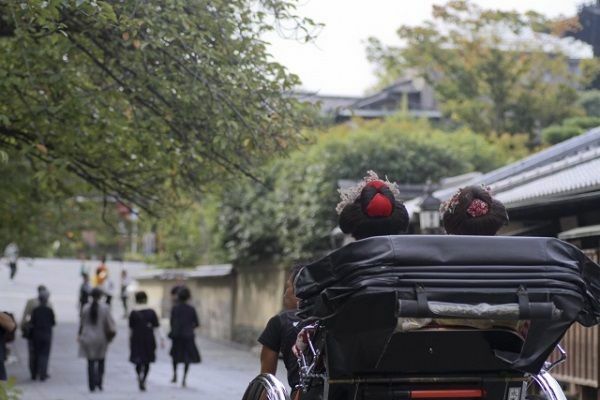 In Kyoto, you can also enjoy the rickshaw in Higashiyama area. This area has a lot of world-heritage temples such as Kiyomizu-dera (清水寺) and Ginkakuji temple (銀閣寺), Gion (祇園) where you can see Maiko and Geiko, many Machiya (traditional style of town houses) and so on. You can take the rickshaw near Ginkakuji temple or Ichinenzaka near Kodaiji temple. Asakusa is known for the Kaminarimon. Here you can enjoy the atmosphere of both Edo period and Showa period. By taking the rickshaw, you can enjoy Asakusa area more! And sometimes you can see a couple of bride and groom in Japanese traditional wedding clothes on a rickshaw around Kaminarimon. You can take it in front of Kaminarimon. Kamakura is easy to access from Tokyo, and was the center of politics about 800 years ago (Kamakura period). Here you can enjoy temples and shrines which have traditional architecture and Japanese garden, cultural assets such as colossal Buddha and beautiful seasonal flowers. You can take the rickshaw in front of Kamakura station or on the big street which leads to a shrine called Tsurugaoka-Hachimangu (鶴岡八幡宮). Miyajima is known as one of the top 3 beautiful scenery in Japan. There is Itsukushima-jinja shrine which is widely known for its huge trii (a gateway at the entrance to a shrine) on the sea. And you can see lots of deer on this island. You can take the rickshaw in front of the dock for the ferry. When you visit these areas, enjoy the great experience with jinrikisha! !